Reusable hook and loop fastening cable tie wrap for wholesale from China manufacturer, supplier; they can be used for various wires, cables, cords and more, customized color accepted. What is the hook and loop cable tie? Hook and loop cable tie is also named Velcro cable tie and magic zip tie. It has two parts. One is the hook part. And the other is the loop part. More and more Velcro straps are gaining popularity, with some technicians using them exclusively. They are preferred by many due to their ability to be used and reused time and time again. These zip ties come in a bunch of sizes, plus large continuous rolls. And they can be cut and customized to fit the length requirements for the job at hand. Overall, hook and loop zip ties are thought to have the advantage when dealing with extremely large bundles. Who invented hook and loop zip tie? Velcro cable straps are durable, economical, reusable, anti-corrosion, resistant to moisture and many kinds of the harshing working environment, low profile as well. They are widely applied in the computer data lines, networks, and our daily life can find them too, in the offices or on the desks of our studies. The common color is black. 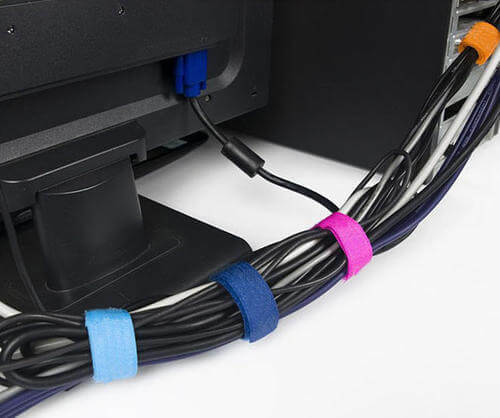 Many people select a combination of zip ties and Velcro for cable management. Velcro zip tie carries a good solution for our daily life. It is so versatile, applied in the arrangement of the cables and wires of mobile phones, computers, domestic appliances, and net bars. So who invented such a wonderful thing in the world? That was an engineer Geroge. One day, he was back from the hunting, He found Bidens tripartita binding on his clothes. Then he used the microscope to watch this kind of grass. He found Bidens tripartita had one kind of special structure. This structure can make it binding on the knitted clothes. So he planned to use the hook to fix the loop. That was how he invented the Velcro zip ties. In fact, in the feather of the birds, there have been such kind of structure. The feather of the birds is composed by the scapus and pinna. The pinna is composed of many long and thin pinnule. Both two sides of the pinnule have many small pinnules. One side of the pinnule has the structure of hook. And the other side is the loop. The hook and loop structure can make them binding together, to be the feather of the birds. The feather is very strong and flexible. It can flap the air and protect the body of the bird. The bird will use the oil secreted by the preen gland to make the feather in good structure and function. What are the materials to make hook & loop cable ties? There are many kinds of materials to make our magic zip ties. Now let’s learn something about them. This material is difficult to extinguish. And it is very flexible. Moreover, it is environmentally friendly. Hook and loop zip ties are usually used in the clothes, so it is better to be environmentally friendly. This kind of material is easy to be extinguished. It will lead to smokes. And there will be some pungent flavor. And Dacron is hard. It is rough when we are touching it. This kind of material has occupied with all the features of Nylon and Dacron. It is difficult to be extinguished. And it is very durable. 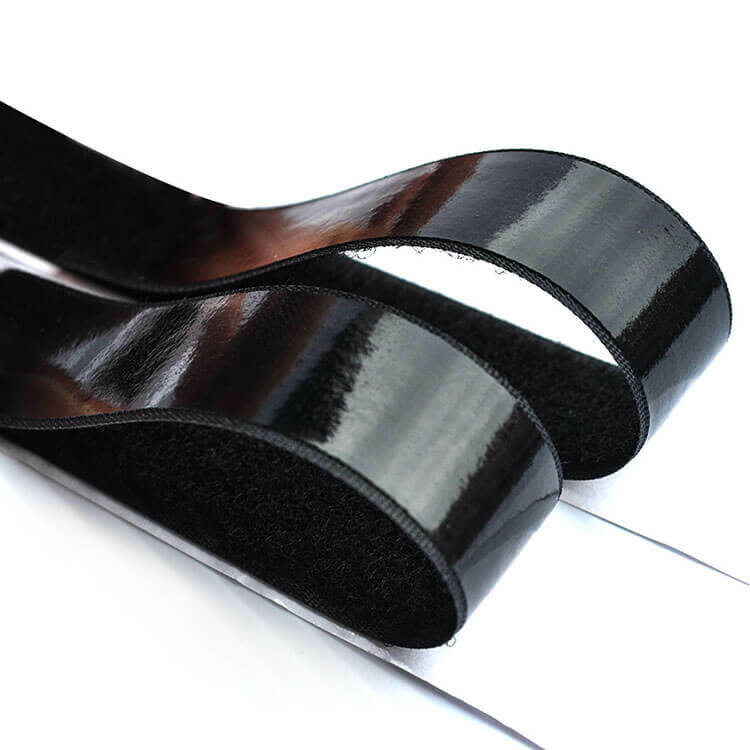 Adhesive Velcro straps are made by this type of material. It is extremely soft and flexible. It is usually used in the underclothes. And it also can be applied in the infants’ clothes. It is not harmful to the infant’s skin. It only has the loop. And the hook is applied with the A Level Nylon material. It is commonly used in our underclothes. What are the types of hook & loop zip ties? Hook and loop strap is also named of the magic strap and Velcro cable tie. It is different from other kinds of the zip tie. The self- locking zip tie has the function of not- retreating. It cannot be loosed after the locking. The magic cable tie will be reused for many times. It is widely used in many places. There are various types of hook & loop ties. It is made by the nylon magic tie. The reverse side of the tie will be added with adhesive glue. This glue should be through the heating process and the pressing process. When you are going to use the adhesive hook and loop zip tie, you can just open the release paper. Then you will get an adhesive tie to paste onto the surface of kinds of articles. This kind of magic tie has two parts. Loop part and the hook part are the main parts. We can use them again and again. They can be found in the cables, wiring lines, optical fibers, toys, electronic appliances. This kind of magic cable ties is used as one kind of hair curler. When the hair designer is making the curly hair, there is no need to use the hairpin to fix the style. This type if featured for the combining of hook and loop. It has a good adhesive function. It has a very wide application. It is used in clothes, bags, shoes, sports articles, medical goods, wigs. It is not strong in the adhesive function. But it is very durable. This type is a bit different from other types of Velcro ties. The part of the hook is made by the Polyester. It is very firm. Moreover, it is designed with the mushroom style in the shape, so it owns very strong tensile strength. And velcro reusable self-gripping cable ties are also very popular on the market. The types of magic ties are very various. What are the features of the hook & loop cable tie? With the development of technology, the magic cable ties have got more and more advantages in the application in the life and industry. Many hook and loop cable ties manufacturers have absorbed the advanced skills from the overseas. They have a g improvement in the processing and the management of the bundling ties. The Velcro cable ties are equipped with many features and advantages. It has a strong strength as the steel belt. And at the same time, it can resist to the high impact. In addition, it owns good flexibility. It can ensure the safety of your goods. The ductility of the magic tie is 1/6 of the PP made ties. So it can make sure the high tensile strength. Another advantage of hook and loop tie is that it doesn’t require scissors or a cable tie removal tool to remove it. Despite the fact that Velcro cable ties are by and large more costly than zip ties, many consider the extra cost worth it because they are able to reuse it. The melting point is 260 °C. And it will not get out of shape if the temperature is kept under 120 °C. It has no sharp corners. It is safe to operate and use. And you don’t need to worry about if the tie will hurt the articles. It is very easy to use and convenient to carry. No matter it is to lock the tie or to tear the tie separated, it is very simple to operate. The price of the hook and loop tie is very attractive. It is not expensive, but very affordable. 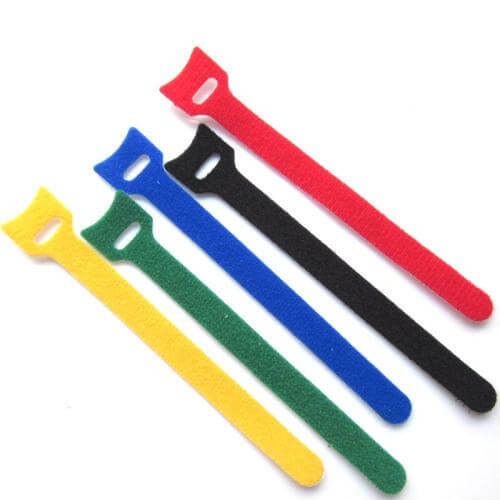 Velcro Zip Ties are special for variety in color, red, yellow, black, green, blue and so on. These vivid colors make it easier to distinguish different types of wires. And these colors add convenience for the electricians to check the wiring systems and reduce the consumption of time and labors. The raw materials to make the Velcro ties are very various. They can be nylon, Dacron, and so on. And it has very expensive applications in all walks of life. It is very popular in the industry. All in all, our lives are changed by the colorful magic ties. They have also improved the convenience of our lives. With the development and improvement of society, these ties must bring us more and more surprises. What are the applications of the magic zip ties? Velcro cable straps are so widely used in our daily life. They are found on the desk of the office desks to bundle the data lines of computers, audio phone, mouses, mp4, mp3, and many other kinds of power lines. They are also applied in the clothing, shoes, caps, gloves, handbags, sofas, ships, cushions, aviation supplies, curtains, raincoats, toys, sleeping bags, sports goods, sound equipment, medical facilities, tents, electronic wires, chargers, and so on. These ties are made of flexible and soft material to hold the protection for the cables or wires out of the damage and to make them secure and fastened. It is convenient to carry and install this kind of plastic Nylon cable ties. Inserting the tie into the holes of the bracket by hands, which is done easily and fast, without any tools. Moreover, Velcro cable ties can be retreated. They could be reused many many times just according to the demands of the customers. Hook & loop zip ties are highly spoken by the field of High Tech Electronic Industry. More and more hook and loop products are designed. And many of them are put into the use. The products of Dell, Samsung, Apple, Lenovo these big high tech electronic companies have used them. How to clean the hook & loop cable ties? As we all know, magic zip ties are so popular. It can be seen everywhere. But do you know how to clean these ties? Sometimes, they will get dirty and they will lose the function of adhesive. If you know something about how to clean them, you can make the tie with longer service life. It is not right to clean it after the tie has got very dirty. A long time of no cleaning state will make the ability of adhesive reduced. 2. Avoid cleaning Velcro ties with water. The water can not clean them clearly. And it will make the adhesive ability of the tie affected by the water. The industrial alcohol can easily finish the cleaning task after several times’ wiping. It is important to choose a reliable hook & loop zip tie supplier. 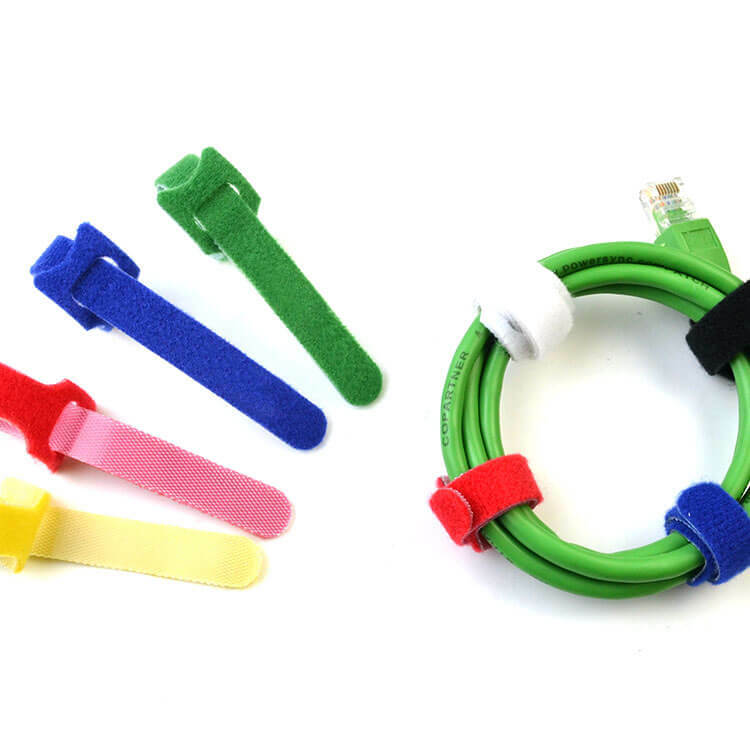 Hook and loop cable tie is used to organize kinds of wires and data lines and makes them tidy. They are made by the new process with one special material. Besides, they do a od job in resisting to acid, heating, aging, and excellent insulation, endurance, tightness. It is very convenient to take and use. So choosing a good Velcro zip tie manufacturer is also very important for you and me. Now I will introduce HONT to you. Founded in 1997, HONT is the leading manufacturer of colored velcro cable ties, has been more and more acknowledged by people. The company’s mission is to provide the best experience on the Internet for buying Consumer Electronics. We focus on making purchasing online a pleasant experience. Our sales office is located in Zhejiang province, China. Why are our prices so low? It is simple. With the excellent HONT people, great enterprise culture, the company has successfully expanded her market from the small region of Liushi, to the whole globe during the ten years’ exploring and developing positively. The products of this company are reliable and high level, which are all under the most strict quality monitoring system. We cordially welcome friends to build a siness relationship with us.